We had the opportunity to closely examine the painting below which was offered for sale at the September Maine auction of items from the Quirk estate. We believe it depicts Francis and his wife Anna attending some type of event. We suspect it was a wedding,concert or reading of some type as both are holding leaflets or programs. Like many portraits it features the two decked out in their finest clothes. Anna rests on a coat with a fur collar wearing a silk blouse, stylish hat, and fine shoes. Francis wears a blue suit in a shade close to Anna’s dress. dress. 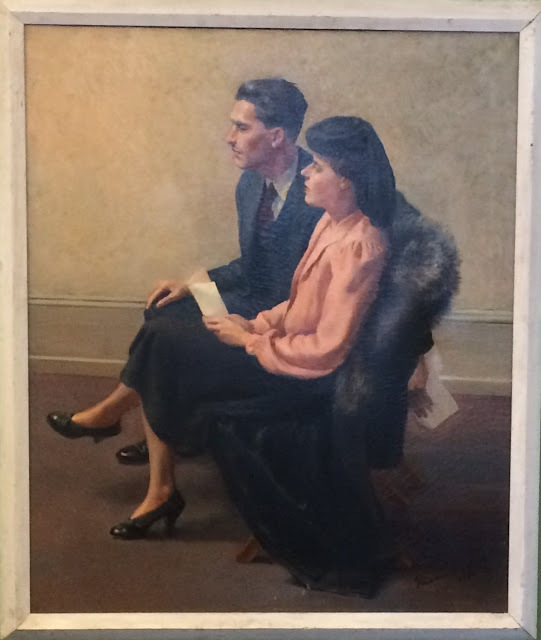 The painting signature is dated 1940 when Quirk would have been 33 years old. In examining the reverse of the painting we noticed two interesting labels. The first is an exhibition label from the Pennsylvania Academy of Fine Arts. The Pennsylvania Academy of the Fine Arts is a museum and art school in Philadelphia, Pennsylvania. It was founded in 1805 and is the first and oldest art museum and art school in the United States. The academy's museum is internationally known for its collections of 19th- and 20th-century American paintings, sculptures, and works on paper. Its archives house important materials for the study of American art history, museums, and art training. The famous Philadelphia painter Thomas Eakins volunteered there as a teacher. In checking the Academy website, we found this exhibition that matches the dates on the label. We are in the process of seeking out images from the catalog. There also was a restoration label. from Hiram H. Hoelzer, Inc. The company is an art restoration company that was most recently located in Greenwich, Connecticut, but may no longer be active. The back of the painting showed no obvious tears or repairs so we are curious as to the tie with this painting.